Silver_Zip_Closure_Foils is rated 5.0 out of 5 by 1. Is this USPS approved to mail? Hi is the envelope total size 9x12 or does it hold 9x12 documents? The total size is 9 x 12. Thanks for your question! Hello, I was wondering if it's possible to receive a sample of this product in a few of the available sizes? I would like to order a large amount for a mailout I am doing for work, however I am unsure which size will fit our needs best. Hello, Thanks for your question. We have a web page just on our Product Sampling policies, I've linked it below. http://www.jampaper.com/Product-Samples.asp If the information provided on our page doesn't answer your sample-related questions, don't hesitate to contact one our representatives at 201.567.6666 Mondays-Fridays between 9:00 AM and 6:00 PM EST. Thanks! What's shiny and bright and zips up tight? 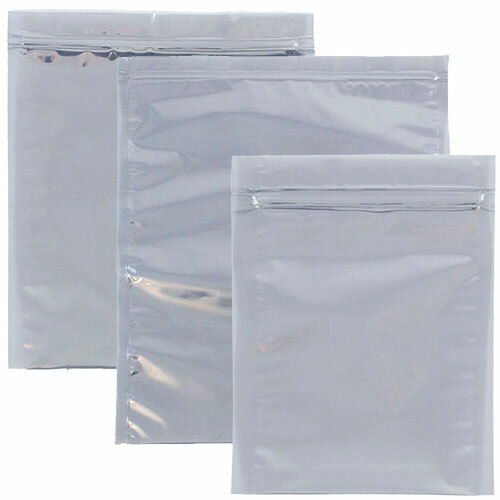 These Silver Zip Closure Foils, that's what! When you want your envelope to make a statement, this is the one for you. The awesome shine doesn't happen with just any kind of material. Our foil brings out that extra brightness you're looking for. The silver color will compliment any occasion too! From an elegant Christmas card to an invitation to your galaxy themed party, this silver will highlight any content. The best part is that these silver envelopes have see through foil! So you get an added layer of intrigue with just the outer material. And the assortment of sizes will let all of your events be super coordinated too. Last, but certainly not least, is the easy zip lock feature. All you need to do is zip it up and send it off.